I had a crazy long week. It’s a good thing my work week is Monday -Thursday. Let me say that sounds gross during the week when you realize how long the day is, but when Friday morning rolls around…yeah, that’s a good thing. I usually pray the rosary on the way to work in the morning. Let me tell you, it’s better than the trash on the contemporary music channels, and let’s not even discuss the shock jocks. I’ve learned to love my morning talk with Mary through the rosary. Much better than talk radio! So this morning I got started with my usual rosary and stopped after barely getting started to take a call. It seemed that every time I went back to thinking about the rosary I got distracted by little fires that I had to put out (okay, see that? go ahead and follow how metaphorical that is). At any rate, it was quite late in the day, actually on my way home, that I pulled out my little companion and set myself to concentrating, as best I could in traffic, on the rosary and Thursday’s mysteries. The luminous mysteries are my favorite…it has very little to do with BL. JPII although I remember well the controversy at the time he introduced these mysteries. There was some resistance in my circles in the order of “how dare he change the rosary” (well, it was a pretty bold move, but oh so logical — I’ll amuse my theology buds and actually suggest you read Rosarium Virginis Mariae — I know, close your mouth, sometimes I really do read this stuff on my own). I don’t claim any particular illumination (heh-heh) beyond the fact that they resonated beautifully for me. In fact, I have to say, it was because of the luminous mysteries that I gave the rosary another serious whirl, and I’ve been hooked ever since. The problem was, and still is, that I have a terrible time memorizing things like lists, or movie lines, or prayers. I have to employ a gazillion mnemonic devices, and hope they work…but I learned that if I associate a particular mystery with a family member or friend, then I can remember them (both! the mystery and the person for whom to pray). The First Mystery of Light, the Baptism of Our Lord: for the longest time, I would recall the baptism of my children to remind me of this mystery. I always think that when God’s voice was heard say ing “this is my beloved Son” it was the jarring moment for me, in a slow reversion process, to wake up and begin to get it. More recently I’ve come to associate it with a friend who teaches an awful lot on baptism and living the promises and graces that come from it. The Second Mystery of Light, the Miracle at the Wedding of Cana: this mystery clarified for me the whole misunderstanding so many people have about Mary, and especially the rosary. When Mary says “do what He tells you” it was another a-ha moment for me…the focus being on Jesus, and listening to Him. These days, when I get to this mystery I think of a friend getting married soon. The Third Mystery of Light, the Proclamation of the Kingdom of God: this one, too, was quite powerful. It is when Jesus begins his public ministry, but for me was the recognition of this call to conversion, and so important to me, how it is also about reconciliation and hope. I often think of the work I do in new media, and the wonderful people I’ve come to know, in real life, and through social media — and pray for them all, the ones I know, and perhaps most especially, the ones I’ll never know. …The Fifth Mystery of Light, the Institution of the Eucharist. Well, it all leads to this, no? The source and summit of our faith! Thanks for coming on the commute with me. 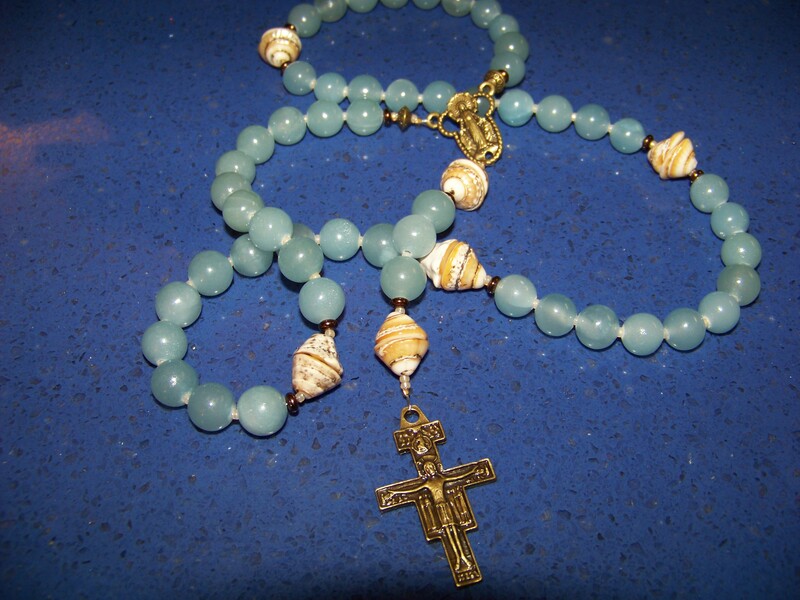 Do you have a favorite mystery or mysteries of the Rosary? I used to always, automatically reply, “Luminous.” (implied: DUH) because they’re shiny, fresh and new. However, as I get older and grayer, I have come to appreciate the traditional mysteries and how they bring me closer to Mary.